Coaching from MARIOBEKY.COM (Advanced Mental Coaching AMC) is World’s first self-coaching system that can be customized. AMC rose from results of studies. First of all, this is the psychology the easy way and for ordinary people. Our products (books, coaching, seminars) offer simple systems with instant effects. Support and assistance guarantees necessary guidance for constant growth. 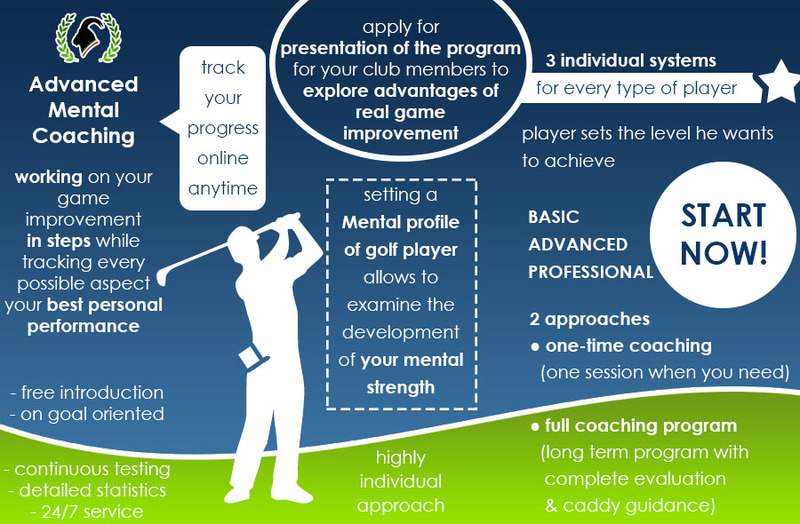 Explore the options and work on mental game from the very start. Therefore AMC suits all levels (age, expectations, abilities). In sport that means – amateur players use the same system as professionals. AMC – mental game program for sport contains 17 sessions which focus one goal and are pro – active. They follow chronically and rely to each other. Every session shows something new. Successful acquiring of new abilities in mental toughness allows player to grow not only in theoretical basis. Player who decides to apply for program gets full customer service. One session of AMC takes from 2 – 4 hours (theoretical basis or real time guidance). First of all we start with primal testing. We gather info for the Mental Profile of the Player (MPP). Player receives Unique Client ID Number and gains access to his progress online (full stats of overall coaching progress). AMC is strong yet easy to understand system. You either pick the full program or individual sessions (in AMC’s chronological order). It offers the most profound system of support and targets individual experience. AMC is for every person who wants to have more fun when playing favorite sport. Increase your performance and convert it to another simple habit. Once you’ll strengthen the skill you’ll execute it without thinking about it. We experience 100% positive feedback from our customers. This makes us very proud to be the first and the best in providing the mental game for amateur players. Mental game and better results in a way you don’t know yet is ready for all active people with goal to succeed even if playing sport only for fun. Therefore we keen to offer our knowledge for much less than others do. It is not us anymore. It is me and how my life is organized. We didn’t create just another program that you first need to implement for years and then hope for some results. What do you do when you are hungry? Exactly, you eat. You eat now. Would you rather wait month, week, day later and then satisfy your hunger? Absolutely not. Our ambitions and our needs are based on the same principals. They ask for fulfillment in the present time therefore we are delivering a system that is applicable immediately. Better results in sport, better results in learning and almost in any other activity need to be almost always at hand. But first of all they need to be available in the present time close to you. Do you remember who is and always was your best teacher? YOU! You are also your best coach.